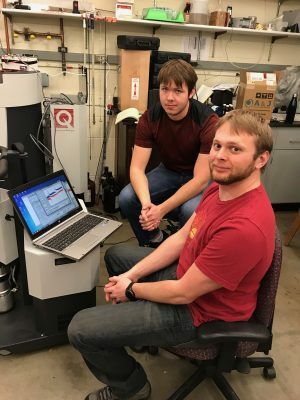 Welcome to The Frustrated and Quantum Magnetism group and the Ross lab in the Department of Physics at Colorado State University. Our research focuses on emergent phenomena in correlated electronic materials. We focus on the synthesis (i.e. crystal growth) and characterization, via neutron scattering, of strongly interacting magnetic materials. A particularly exciting goal of this research is to realize what is known as the Quantum Spin Liquid state, where magnetic moments dance together in an entangled, correlated, but ultimately disordered and dynamic way. 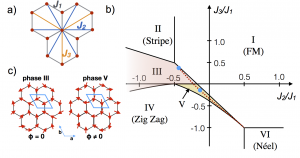 Crystals with magnetic degrees of freedom offer enormous diversity of emergent phenomena arising from simple near-neighbor interactions in a vast group of magnetic ions (~1023 of them!). Dynamics ranging from “classical” spin waves that propagate a spin flip through an array of aligned moments, to emergent photon-like excitations that mimic electrodynamics, can be created, probed, and understood in this environment. We use neutron scattering to directly probe the static and dynamic correlations in such materials. 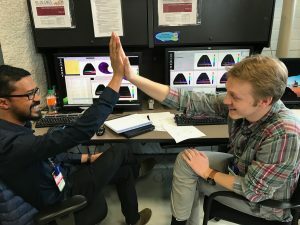 Neutron scattering has the advantage of providing directional and energy-resolved information, which can be successfully and simply compared with theory. Through collaborations with solid state chemists and condensed matter theorists, we strive to push the boundaries of magnetic solids towards strongly quantum entangled states. Our group is developing a home-built resonant ultrasound spectroscopy (RUS) insert for the PPMS that will operate at fields up to H=9T and temperatures down to T=2K, with help from Prof. Leisure (CSU) and the Ultrasound group lead by Albert Migliori (Los Alamos National Lab). We successfully acquired our first low temperature RUS spectrum in Jan 2018 and look forward to using this new tool. 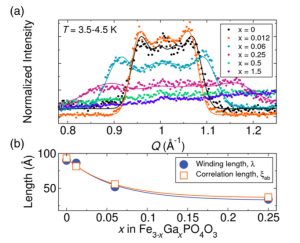 We have investigated the effect of magnetic dilution (substituting Ga for Fe) on the partially ordered helical antiferromagnetic ground state of Fe3PO4O3. The helical state in this compound is known to form in needle-like domains, with short range correlations in the ab plane. Our most recent results, published in PRB, show that the helical pitch length and the ab plane correlation length are intrinsically related to each other – the pitch length appears to set the size of the correlations in the ab plane. This is reminiscent of Skyrmions, whose size is set by the helical pitch length. Our paper on the single ion properties of Cobalt-based S=1/2 pyrochlores NaCaCo2F7 and NaSrCo2F7 was published in PRB as an editors suggestion. Based on inelastic neutron scattering, from which we can extract the single ion angular momentum wavefunctions and thus their g-tensor anisotropies, we show that these materials are good examples of the S=1/2 XY antiferromagnetic pyrochlore model with exchange disorder. This model is currently being discussed in the context of “order by disorder” and these pyrochlores appear to be a counter-example to this phenomenon. 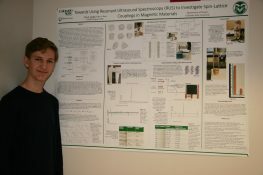 Oct. 2016: Tyler Dodge wins a best student poster prize at the APS Four Corners section meeting in Las Cruces, NM, for his work on Resonant Ultrasound Spectroscopy. 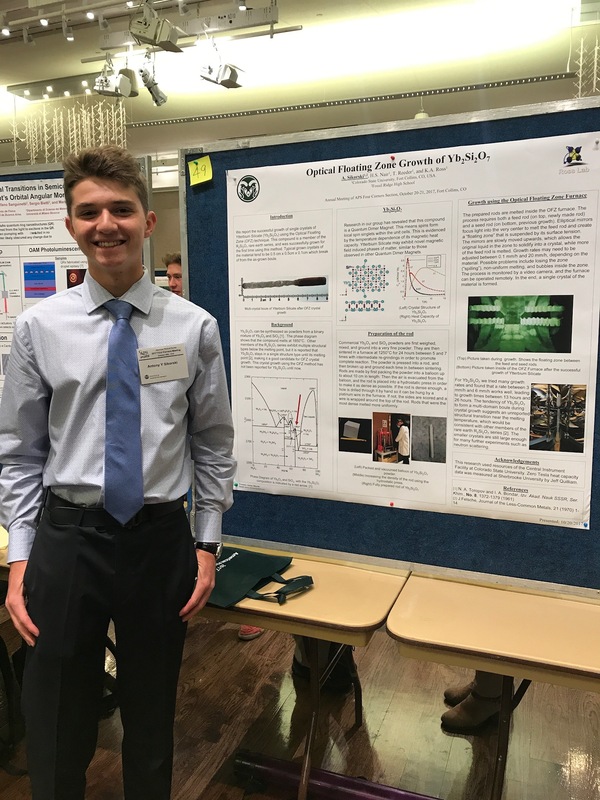 August 2016: Tyler Dodge wins a best student poster prize at FRAMS (Front Range Magnetics Symposium) for his work on Resonant Ultrasound Spectroscopy. May 2016: Cory Berg joins the group as an undergraduate researcher and Gavin Hester joins the group as a graduate researcher. Welcome Cory and Gavin! Feb. 2016: Dr. Hari Nair joins the group. Welcome Hari! 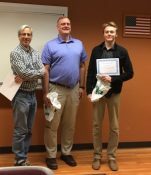 Jan. 2016: Tim Reeder joins the group as an undergraduate researcher, and Jake Walker joins the group as a graduate researcher. Welcome Tim and Jake! Nov. 2015: Kate was elected to the SNS-HFIR User Group Executive Committee (SHUG-EC) for a 3 year term. Nov. 2015: Jesse attended his first neutron scattering experiment at the NIST Center for Neutron Research. 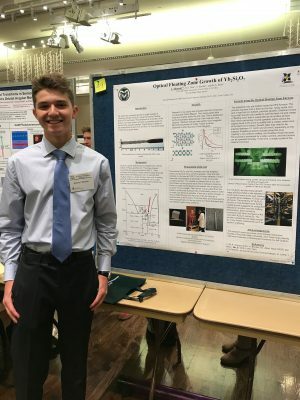 Oct. 2015: Jesse attended the APS Four Corners Meeting in Arizona and presented a poster about his ongoing research project. July. 2015: Jesse and Kate attended the Kavli Institute for Theoretical Physics (KITP) meeting “Novel States in Spin–Orbit Coupled Quantum Matter”. Kate spoke about her recent work on Yb2Ti2O7. June 2015: Kate spoke at the Gordon Research Conference on Neutron Scattering, held in Hong Kong. Jan. 2015: Kate taught at the Winter Theory School in Tallahassee, see slides from the school, including my lecture on “Experimental Pyrochlore Systems” here. Sept. 2014: Kate signed on as Assistant Professor in the Department of Physics at Colorado State University, beginning August 2015. Sept. 2014: Kate took up an NSERC Post Doctoral Fellowship at Colorado State University, working in the Neilson Lab in the Department of Chemistry. She worked on crystal growth and synthesis, particularly on the material Fe3PO4O3. 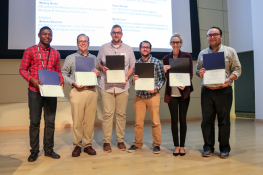 Kate was awarded the 2014 Prize for Outstanding Student Research from the Neutron Scattering Society of America, and presented at the American Conference of Neutron Scattering (ACNS) in June, 2014. 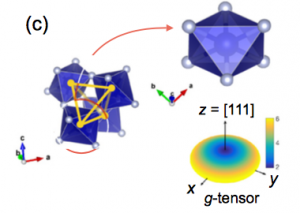 Quantum Excitations in Quantum Spin Ice. Phys. Rev. X 1, 021002 (2011). Neutron Laue Diffraction Study on the Magnetic Phase Diagram of Multiferroic MnWO4 under Pulsed High Magnetic Fields. Phys. Rev. Lett., 106, 237202 (2011).